The OP was on the site yesterday midday (UK) time, hopefully absorbing the atmosphere. I recall chuckling over a little cartoon many, many years ago, of two Moon-dwelling aliens in a flying saucer heading for Earth - one turns to the other and says "You'll like this place, it has atmosphere...."
Aparently i must be wrong. Expecting a hobby to be stress, pressure and peer-opression free, proves me to be out of touch with the modern times. Never underestimate the passion in a hobby turned into it's my way or the highway. Haven't had a hobby yet where I have not encountered this to some degree. Just learned a new expression. thanks. Train idiot, one of the best things for you to do, in my opinion, would be to find a copy of LGB's book, The World Of LGB. It explains the EPL System. EPL simply are the first letters of the original company name, Ernst Paul Patenwerk. I found that working with LGB's system very simple, when I finally embraced it almost thirty years ago. Of the manufacturers out there, LGB offered the most information and technical experience at the time. I completely understand the point of frustration. I hate this, and have since i was a child with trains. 1 the shuttle you need, among others, is LGB 10340. It has an adjustable acceleration and deceleration,and adjustable wait time. It is identifiable as it has 2blue “wheels” on the underside, on the electronics board.. These are the adustable potentiometers for the accel and wait features. Earlier units dont have this important feature. Earlier versions are hurky jerky stop and reverse. The newer ones are more convincing, and, easier on loco drive trains. Heres the truth, for me. I dont want to manage a lot. 2 one key to pleasant track powered operation is tight,clean track joiners! Fishplates (joiners) stock,can do this. They may need to be pinched for a tight fit. Lgb joiners are beefy, and can be pinched nicely, others, like aristo, are thin, and don’t have the grip. Piko are good, heavy. Old joiners , especially if used outside may need to be cleaned of grit and oxidation. To clean oxidation, i dip a cotton swab in liquid flux for solder, and the rinse clean. Better are,rail clamps.best thing since sliced bread. You cannot believe how wonderful reliable track connections are. As mentioned above, track jumpers are another option. Theres no getting around the work of good track connections. 3 you must have clean track. This must be done much more frequently than you may expect. I clean everytime i run outdoors, and every few days inside. Get an lgb red track cleaning block and use it. If your track is dirty, you use higher voltage to make connection to the wheels. It can cause micro arcing and pitting of wheels. A spiral down in terms of conductivity. Clean is good! 4 i am unfamiliar with bachmann track. I use lgb. As they say in horses, real or iron, no foot no horse. You mentioned stuttering in your first post. This could be dirty track, dirty loco wheels, or both, and perhaps poor track conductivity. Hope fully others will mention their own experience with bachmann track. 5 while i have 4bachmann spectrum locos and so far they run superbly!imho,bachmann is under engineered and im always ready for irreparable failure. Just me. Buy an lgb loco in great condition for trouble free operation. Lgb locos have sliders or shoes that slide on the track to pick up electricity (as well as the wheels) this is a superior method, as it eliminates the micro arcing almost entirely. I strongly recommend lgb for frustration free reliabilty. Short of occasional wheel cleaning,they run like a Mercedes. 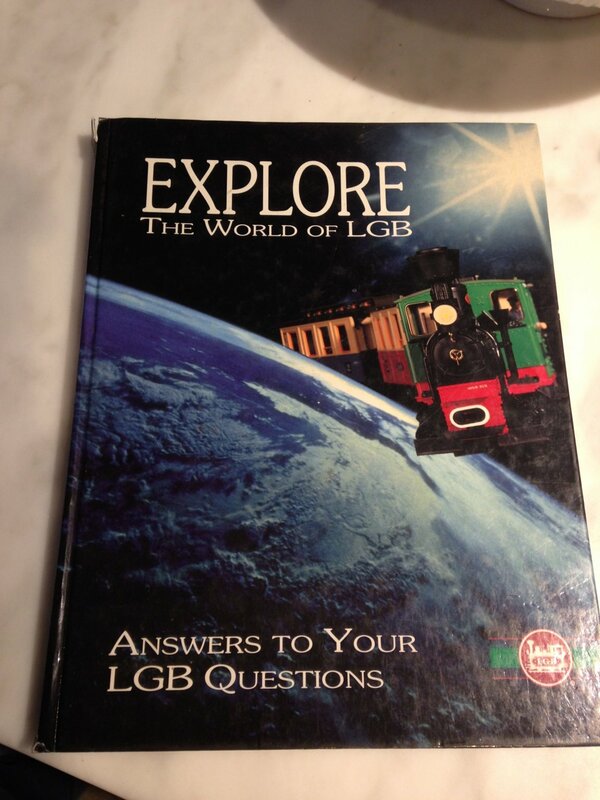 I too recommend the world of lgb book. From the people who have posted over the years with inside layouts, power problems and track oxidation is much reduced. Regular joiners with maybe a bit of grease when installed seem to be enough, and running trains with skates seems in most cases to be all the track cleaning needed. There's always exceptions, people who somehow have pollutants in the air, weird stuff in their basement, the guy who sprayed his house with mildew killer and got it no the rails and they turned black. But in the most part inside is much easier. As of today, dec 5, 2018, there are 7 "explore the world of LGB" books on US amazon starting at about $25. I have always loved trains. I always dreamed of having a train. A couple of years ago, I decided that the "average dummy" ought to be able to figure out how to make a train work. Apparently, I am substantially less than the "average dummy". Here is my pathetic story..... I purchased a G scale Bachmann Big Haulers set and launched into a frantic buying session of Bachmann brass outdoor track. I chose a HUGE section of my backyard and made a train garden. After mutliple layout changes, leveling efforts, etc.....I decided that the power source that came with the train wasn't hefty enough to supply power all across the track, so I purchased a different power source. The train went around the track once (while stuttering the whole time) and then stopped. Eventually, the engine began to smoke (not the good kind coming out of the smokestack!) and smelled like burnt toast. Literally, it was fried. After giving up on the railroad for a season, the following season I decided to purchase a different locomotive and power supply. (Note, this is a simple power supply that connects to the track and is not programmable in any way (I believe that DCC is what you smart people call the layouts that are programmable). It works great when I have the time to clean the track and pull all of the plants that tend to grow up through the track out of the way. My landscape was designed for beauty and not so much for practicality around a railroad. See what I mean? I did it all wrong. I no longer have the time nor the patience to fight with my garden railroad. It brings stress, rather than joy into my life. I would very much love to salvage some of the items that I have already purchased, by having my train run at chair rail height in my spare bedroom. My issue is this.....with doorways and closets, it can't run in just a simple loop. I have a lot of brass track, an awesome power supply...so I really want to re-use all of this stuff. Essentially, what I have is a C shape area that it could run in (around the perimeter of part of the room. I would like for it to start at point A.....travel to point B....and then automatically change direction and return, in reverse, to part A.....and then start the whole process over again. Is there something that I can attach to the track to make it do this? I have searched online and am not really finding what I need. I might not be searching with the right terminology. Can anyone help this train idiot? I appreciate you taking the time to read this lengthy post and apologize in advance for my lack of train knowledge/terminology. Don't despair and give up. You have come to the right place for advice and help. This past summer I embarked on a garden railway but shuttered at the cost of locomotives. SOOOOO I opted for buy TOY train engines and kit bashing them to my liking. New Bright and Scienctific engines. This way my investment is minimal. But I did invest in LGB brass track. To eliminate the need for track power I am converting all my locos to battery and R/C control. Just like DCC but without the headaches. I went to a local R/C airplane/car model meet and purchased two Futaba 4 Attack R/C transmitters and receivers. When I told one of the guys that I can repair them into working order I inherited 6 non working units. Two have been fixed and working. I confessed that some of the controls are 72Mhz and they laughed at me and said HELL no one uses that old stuff to fly anymore so use it to run your backyard trains to your hearts content. I thought I might get arrested. So you see there are people in this model making world who are genuine helpers and advisors. Wholeheartedly agree about names, in my case my names are George Keith but only the Keith is used except in official documents. I know someone who changed his & his wife's name to Lord and Lady George Davis, causes all sorts of bowing & scraping at airports! All perfectly legal and valid. I fail to pair pride, decency, and accountability with the use of one’s real name, although i do see the other side of this point. A bit of anonymity is fine with me. I imagine, steve in denver (with mandolin) could be revealing to one highly motivated to stalk me and my trains....lol.